The eleven songs on this heartfelt tribute are all Rogers originals with only one being a collaboration between Rogers and Josie Carey. Bales’ arrangements are careful constructions that pulse, swing, sometimes surprise and brilliantly support the lyrical content of Rogers music, all the while taking them into the age of musical modernity. His trio is made up of Atlanta veteran musicians, bassist Billy Thorton and percussionist Marlon Patton. These three cats create a singularity of sound that is quite impressive. Vocalist Keri Johnrud has a clear, earnest and pleasant voice. Her approach is more akin to musical theater and she can be heard at her best on songs “It’s You I Like” and “I like to Take My Time.”Bales recalls this music as being some of his very first exposure to the world of jazz. Rogers show, or variations thereof, ran from 1963 through 2001 and was watched by millions of children. The beloved, soft spoken Fred McFeely Rogers died in 2003 at the age of seventy-four.The music was all written by Fred Rogers and often sung by the gangly, good-natured show’s host accompanied his musical director the great pianist Johnny Costa, who was known in jazz circles as the “White” Art Tatum because of his musical facility. The music is sincere and honest and often brilliantly played. You can hear the heart and soul that Bales has poured into this project which was a labor of love for over two years. The cover artwork is a whimsical graphic from trumpeter and visual artist Darren English that captures the spirit of Rogers show. Rogers lyrics were designed to communicate, love, friendship, overcoming doubt and exploring the sometimes-complex feelings that young children experience. He was very effective in that goal and in that context the often simple lyrics were cleverly embedded into some hip music that introduced a jazz sensibility to a youthful, unsuspecting audience. Some believe that Rogers lyrics could be interpreted as having more complex, more adult meanings; the double-entendre effect (a device often employed by his raceier counterpart Soupy Sales), but I don’t believe that was ever Rogers intent. 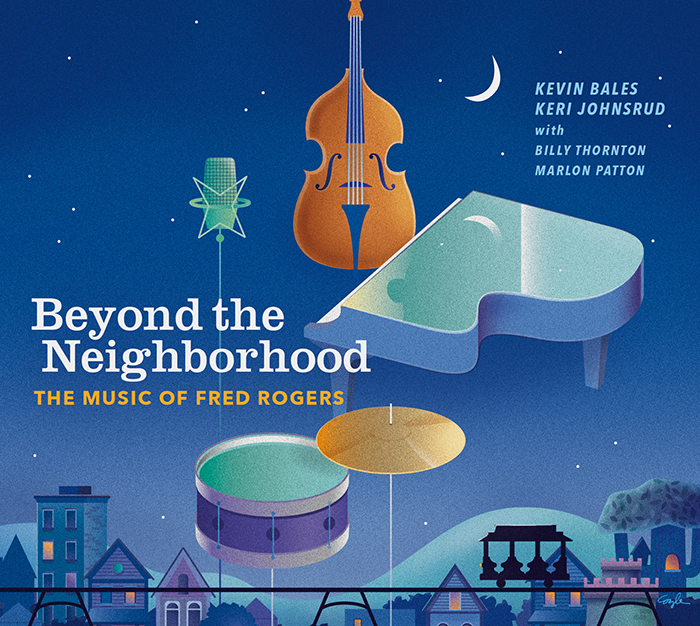 Suffice to say that Fred Rogers music inspired people like Kevin Bales and Keri Johnsrud and for that we can be eternally grateful to the soft-spoken man in the sweater and sneakers.